ESAMI is a premier management development centre whose mandate is to improve performance and management effectiveness of its clients through Management training, Consultancy and Advisory Services among others. 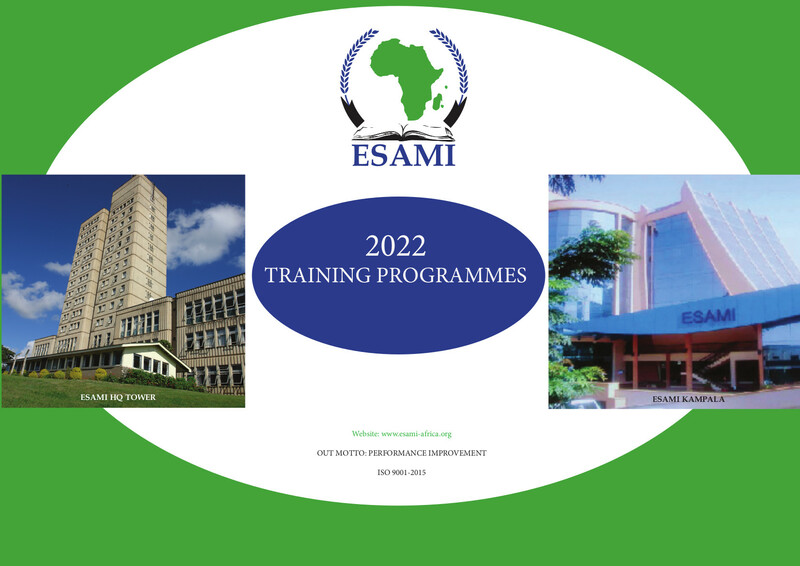 Over the past 35 years, ESAMI has effectively carried out its mandate by providing tailored and customized training as well as consultancy and advisory services over and above the open programmes that it runs every year throughout Africa. ESAMI has the capacity and experience to deliver practical, high quality training for its clientele within their own premises or preferred venue, meeting specific requirements and focusing the training on issues that are most relevant to the organisations. Our tailored programmes are designed with consideration of customers’ specific needs and are conducted at a venue convenient to the customer. There is growing demand for customized training as they are tailored to close specific capacity gaps in organisations. With such programmes, the client has the flexibility to determine the duration of the training, programme venue and topics to be covered. All programmes can be tailored to fit in with your precise training needs which are aligned to your organization’s mission, values and goals and suit your exact context. In-house training is the most cost effective solution to improve performance for larger groups and offers employees opportunities for growth and development. Offering maximum convenience by choosing optimal dates and preferred location. We will conduct the training wherever and whenever it is convenient for you. Building cohesive teams – employees will learn key concepts and applications as a team and gain from group brainstorming and shared learning experiences. Tailor-made programmes require a minimum of five (5) participants from the client organisation to run the training. ESAMI has vast experience and capacity and has so far conducted more than 600 such training programmes in the region. While it is important to build human capacities by unlocking the full potential of the people or individuals at the organisational level through management training, it is equally important and logically consistent that the capacity of the organisations be enhanced. ESAMI accomplishes this noble task largely through Management Consultancy Services whereby process consultancy is used to help organisations improve their structural dynamics and thus harness development and shape the skills and efforts of their managers and staff. Consultancy as a management intervention tool is offered by ESAMI for the purposes of institutional development and enhancement of cost-effective management practices and procedures. The full range of services provided to organisations for institutional development consists of all the areas in which ESAMI runs programmes for management training and development. This hand-holding makes the organisation effectively learn to cope with its problems and opportunities largely through its own efforts. This way it avoids becoming irresponsive to the environment and over-dependent on outside help. Job evaluation and Salary grading, etc. Health Management and Administration For more information on ESAMI consultancy and customized training, please contact any ESAMI office nearest to you.